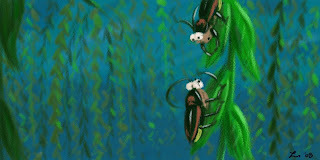 My work continues on Deer in the Headlights: A Lightning Bug Story! I've got the first draft of the script complete, and the first act is already thumbnailed. I'm also working on finalizing the character designs (at least to the point where I can use them in my boards) and the sets. Below is something new for me. I decided to do a few "color/lighting studies" to help visualize the story. 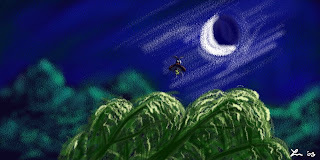 I used Corel Painter (soft pastels) and, naturally, my Cintiq. I think they turned out alright for a first go at such a thing. What do you think?